Background and Objective: The extensive clinical use of capecitabine may be associated with important adverse drug reactions. The aim of this study was to prevent the risk of toxicities in patients who are candidates to capecitabine treatment. Methods: Pharmacokinetic parameters of 5-fluorouracil (5-FU)/ 5-fluoro-5,6-dihydrouracil (5-FDHU) were examined in 133 cancer patients given a test dose of 5-FU (250 mg/m2) 2 weeks before starting capecitabine treatment. 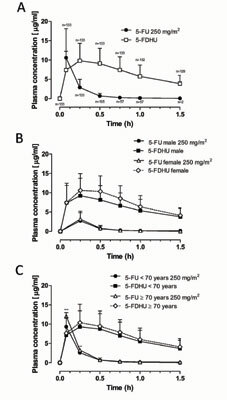 5-FU and 5-FDHU plasma levels were measured, and related pharmacokinetic parameters were calculated. Toxicities were graded according to Common Toxicity Criteria (CTC) criteria. Results: Some significant relationships between 5-FU and 5-FDHU pharmacokinetic parameters and capecitabine toxicities were found. Higher values of 5-FU AUC0-∞ and t½β were found in patients who experienced grade ≥2 dermatitis, stomatitis and nausea during capecitabine chemotherapy. Moreover tmax higher than the threshold limit of 15 minutes was predictive for the risk of developing severe diarrhea after the first cycle of capecitabine therapy. Conclusion: This study suggests a successful approach for preventing moderate/severe toxicities in cancer patients who are candidates to capecitabine treatment by analyzing the 5-FU and 5-FDHU pharmacokinetic parameters after the administration of a reduced 5-FU test dose. 5-Fluorouracil, test dose, pharmacokinetics, capecitabine, cancer, toxicities.